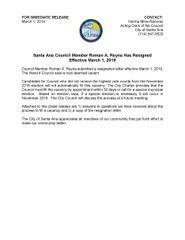 •	Santa Ana City Charter Section 403 states that the council must declare the office vacant and fill the council vacancy by appointment. 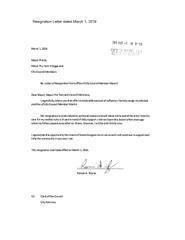 The person appointed shall hold office until the next general municipal election. •	The appointee must, at the time of appointment and continuously for one year prior thereto, have been and be a resident of the ward. No person who has served three consecutive terms as a Council Member may not be eligible for appointment until the passage of eight years. 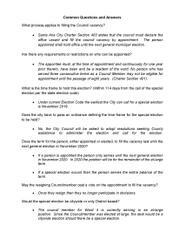 (Charter Section 401). •	Under current Election Code the earliest the City can call for a special election is November 2019. •	No, the City Council will be asked to adopt resolutions seeking County assistance to administer the election and call for the election. •	If a person is appointed the person only serves until the next general election in November 2020. In 2020 the position will be for the remainder of the at-large term. •	If a special election occurs then the person serves the entire balance of the term. •	Once they resign then they no longer participate in decisions. •	The council member for Ward 4 is currently serving in an at-large position. Since the Councilmember was elected at large, the seat would be a citywide election should there be a special election.